Of course you can still place it visibly. He is an eye-catcher anyway! 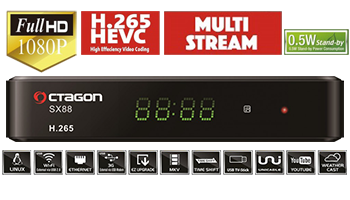 With the Octagon SX88 H2.65 HEVC HD, viewers can take full advantage of the multimedial possibilities, such as Kodi (XBMC), Stalker, XTREAM IP (IPTV), YouTube, RedTube, Internet Radio + (Webradio) and many more.